On the 4th day of Christmas......!! Guess what??!? As some of you know, I am totally fortunate to be on PaperCraftPlanet's Design Team and today it is my turn to host DAY 4 of the 12 days of giveways at Paper Craft Planet. YAY!!! I am so excited to host the challenge! 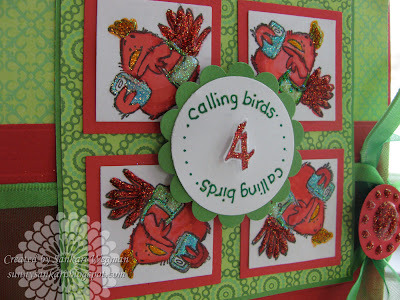 So for this project all you have to do is to make a card with ANYTHING with a BIRD on it and you are automatically entered into the 12 days of Giveaways Contest - where each day a different sponsor is giving away a different gift. Today's Sponsor is Our Daily Bread!!! They have beautiful stamp sets, cardstock, paper, inks, rub ons and more - check out this awesome company created by Kelly Holland (click here) Kelly is giving away the stamp set "Sing to the Lord" you can check out this beautiful stamp set here. So - are you ready to join in the fun!!!??!!! 2. Include the tag 12day4 (all in lower case) - you will find the tag spot under the description for your card/project when you upload the picture of your card/project. This tag allows me to find it and then drag it into our Day 4 Album. It will also make sure that your project will be entered to win a fabulous gift from our sponsor for Day 4: Our Daily Bread. PLEASE NOTE: Paper Craft Planet does NOT automatically load your project into the album. I have to do that manually - so don't worry if you don't see your creation right away - I will be checking throughout the day - a few times every hour to add them in. Just make sure you use the above tag so that I will know where to find it - otherwise it will not show up when I search for items with that tag. Can't wait to see all of your beautiful creations! !Don't forget to check out the blog candy at Cinema Saturday Creative Challenge - this week's challenge at Cinema Saturday is Miracle on 34th Street! And happy December 1st to all of you!! Can you believe that its December!!!! Hope you are all doing great! 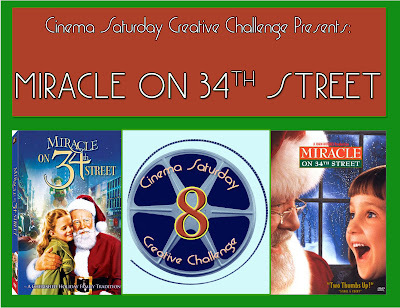 The Cinema Saturday pick for this saturday is: Miracle on 34th Street! Man some of you are hard to fool with the sneak peeks that Brooke posted here. I have to admit, one of my favorite part of this challenge is to read what everyone writes for their guesses -- you guys are awesome! 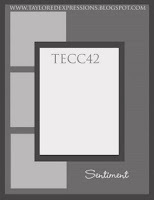 This week's pick is a classic - the original movie was made in 1947 in black and white and a newer version was made in 1994. I don't know how many times I have seen this movie - and always what I remember: is the feeling that miracles can happen and that they do happen. I remember watching this movie as a child and loving theme of miracles. Any story with that tagline always made me so hopeful and left me feeling like we were all connected and that our dreams could come true. This card was inspired by the theme of miracles and that larger theme of human goodness. As I was making this card, I have been watching the news of the current situation in Mumbai, India - and have been feeling this surrealness. I remember being in the Taj Hotel and now to see its state on the news is just surreal. Thankfully the family and friends that I have there are not injured - but my heart goes out to the thousands injured and all of those whose lives were taken from this tragedy. This card is inspired by the feeling of hope and of miracles from the movie and I hope that in the world that we live in today, the dream of a united world, one world family, is something that will come true. 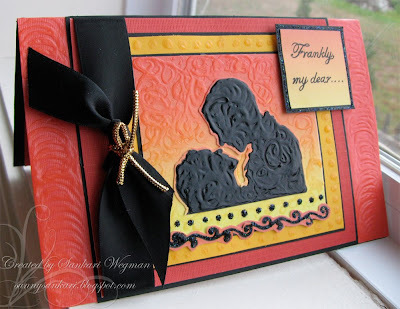 I used the sketch that Kim has created for this week's sketch challenge at PaperCraftPlanet. You can find the sketch here. I created the mother and daughter in photoshop - because it reminded me of the daughter (Natalie Wood) teaching her mother (Maureen O'Hara) how to love fully. I cut out the figures and painted them and then pasted them on a universe scene that I created in Photoshop. I stickled the stars with Diamond stickles and painted the North Star. The cardstock is all from my scrapstash, the DP is leftover Oragami paper, the bow is from Martha Stewart and the embellishments are from a stash of scrapbook stuff from eons ago. I typed the sentiment and then printed it and adhered it. All of those who enter the Cinema Saturday Challenge this week are entered to win some awesome Blog Candy. Don't forget to check out Brooke's awesome scrapbook layout for this week's challenge and her pictures of her adorable cutie patootie son!!! Come on over and join the fun!!! Check out all the details here: at Cinema Saturday Creative Challenge. Thanks so much for coming over to visit!! I hope that you are all blessed with miracles in your life! 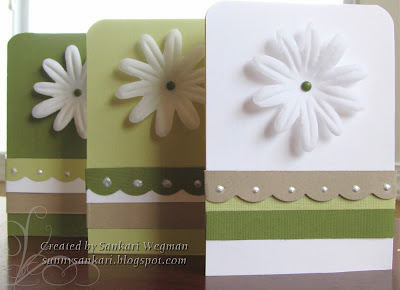 Here are two cards made for Kristina Werner's Color Inspiration Challenge # 32. It's amazing that we are on the 32nd challenge - wow! This week's color inspiration comes from the above cool picture from Crate and Barrel. It is from their section on Oversized Light Bulb ornament set. I enjoyed these colors together and made two cards for this challenge. 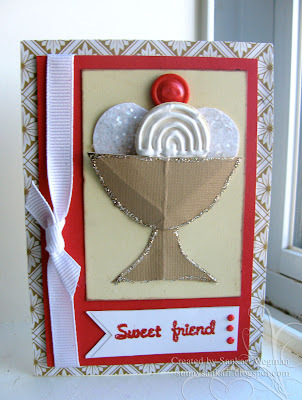 The colors for this challenge was riding hood red, sahara sand, very vanilla and whisper white. We could also use a metallic color (gold or silver) to substitute for the sahara sand. The first card is made for a sweet friend of mine who has been such an inspiration to me. I created a little sundae using my littlest circle punches which then I painted with liquid pearls and glitterized using Martha's coarse crystals. The background DP is also Martha's. The sentiment is from Taylored Expressions and the Ribbon is Offray. The button is from my stash and I added a little red liquid pearls to the "cherry". The sundae container I cut out of a kraft like paper from an image that I drew and then outlined it in platinum stickles. I followed Jen's Sketch For You to Try for this second card whose base is the very vanilla color. 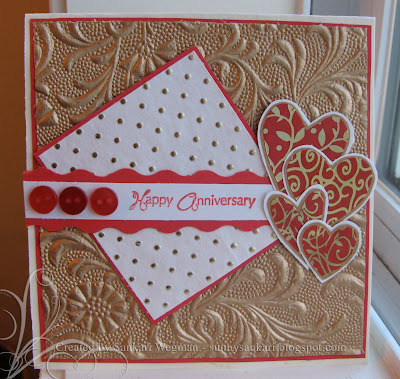 The red cardstock and the embossed gold cardstock have been in my paper stash for more than a year - as has the white with gold dots paper - so I am not sure which company they are from. The hearts are translucent stickers that I had since Valentine's day last year (not sure from whence they came) and I matted them twice for a little color contrast. I stamped the sentiment from Clear stamps and then matted it on to the red cardstock and cut it with some wavy scissors and adhered some red buttons onto one side. Kristina also posted an informative entry about hot-linking. You can read about it here and here. I thought it was very informative and I learned alot. 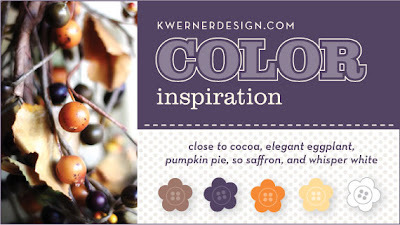 I usually save the color challenge image onto my computer and then upload it from there onto my blog - crediting Kristina for the image and from now on will also credit the source of that inspiration. 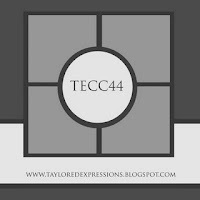 It was good to read it and get a good reminder in blogging etiquette. Well, I hope I will make it before the deadline cut-off ... its been crazy here to write this post in the middle of getting jammies on for 2 wee ones... Hope you are having a great weekend! Check out the fun Sneak Peek that Brooke has left over at Cinema Saturday for tomorrow's challenge!!! come over and check it out here! 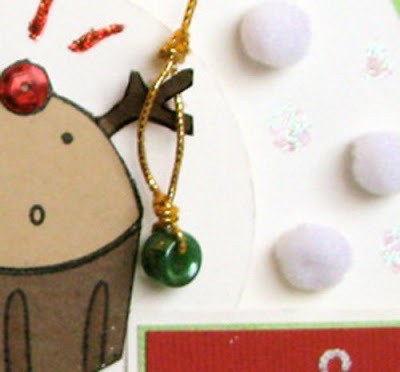 Also check out the fun 12 days of giveway at PaperCraftPlanet - the fun has already started! Hope everyone's Tuesday is going great! Just wanted to thank everyone who has nominated me for an award - you guys are the sweetest - and I am totally honored that you have chosen me - and totally humbled that you even read my blog or leave such sweet comments - you guys are just toooo sweet! 1. Select 5 blog that you feel deserve this award for their creativity, design, intreesting material and also for contributing to the blogging community, no matter what language. 4. Link to the Arte y Pico blog, so that everyone will know the oribin of this award. So I would like to pass this Award to these amazing bloggers - if you don't already check them out - you have to see what these amazing crafters are up to - no doubt you will be inspired! The 10 People I chose for this award are absolutely wonderful creative bloggers who always amaze me with their creativity and inspired me with their sweet comments. 9. Louise - Louise - that's me! 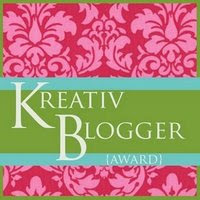 Traci also nominated by for the Kreativ Blogger Award - Traci - you are tooooo much!! you really know how to spoil a girl!!! Thank you so much for this double honor!!! 3. Link back to the person who gave this award to you. The five bloggers who I chose for this award are just stellar crafters - they are amazing, funny, creative and total sweethearts. This award is also for all those who are reading this - I am totally blown away by all the wonderful crafters I have met doing this blog! Even if your name isn't here - you are totally tagged!! 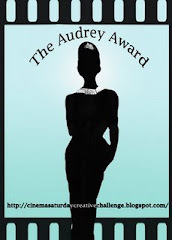 !If you would all like to post this award on your blog and pass it on that would be great. Choose however many you would like...its hard to choose a set number... :) and pass it on! 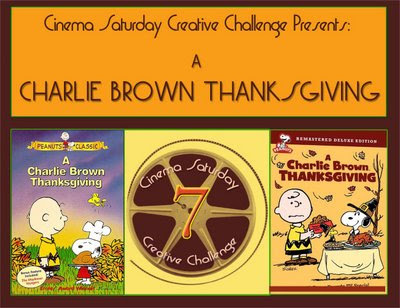 This week,Brooke and I picked the movie: A Charlie Brown Thanksgiving - for the Cinema Saturday Creative Challenge since it is just a classic - for the Thanksgiving Holidays that are fast approaching! Originally, I wanted to make a popcorn card - from the scene where snoopy tries to make popcorn and toast - but after 3 or 4 failed attempts and paper strewn about the floor - I thought I would go a different direction and go with Linus. 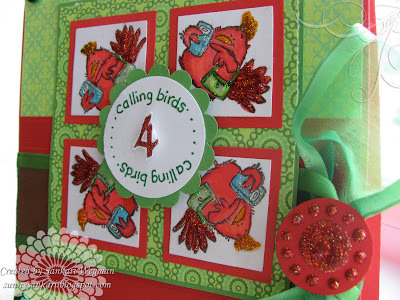 I used Tammy's awesome sketch for the Sketch Challenge over at PaperCraftPlanet for my "Thankful Linus" card. Join our sketch challenge group here on PaperCraftPlanet - and stay tuned because this Friday, we are launching our 12 Days of Christmas giveaways!!! I love Linus and I love that he loves his blanket. I never grew up something like a favorite blanket - but my husband did - and my mother in law has saved his blanket his little memory box of treasures, where it is preserved in its tattered glory. I printed a blank and white image of Linus from this site, and then colored him in and used some waterfall stickles on his blanket for a little extra something. I cut out the image and popped it up on dimensionals and on the oval cut from my CM oval cutters. I wrote the sentiment on some leftover foam and adhered the buttons from Making Memories. The cardstock and DP are from my scrap stash - so not a clue from whence they came... :) This was a really fun card and the best part was making this card for my nephew and also making this card with my son. Did you know that this Charlie Brown Special has been running on air for the last 35 years! WOW! Even listening to the theme music evokes so many memories of watching this on our couch when I was a little girl. So this year it was fun to watch it with our son who is 3. He really enjoyed the scene where Snoopy makes toast and popcorn! 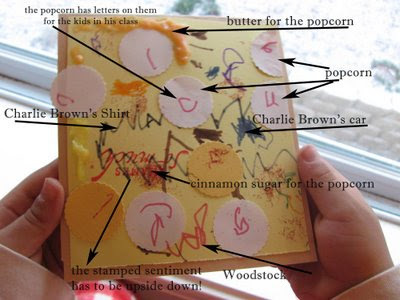 Brooke and I thought that it would be fun to have the kids make a Charlie Brown inspired card to post on our site too - and invite everyone to have their children or grandchildren make cards and post them too. It was so funny to see that he drew a car for Charlie Brown and he totally insisted that the stamped sentiment that he picked out - had to be upside down. It was so nice to have some quality craft time with my son - and the cutest thing was that after he finished he told me that he had "blogged"
So, what are you waiting for!! Go on over to our Cinema Saturday site for more details (click here) and join in the fun. And we would love to see the cards or projects that your children or grandchildren have made too!!! And that's not all. this coming Saturday's challenge has a special blog candy prize all of its own!! So come on back this Saturday for another Cinema Saturday Creative Challenge movie pick!!! Hope you are all having a great week so far!!! Lots of stamping hugs to all!! Gratitude, Xmas, Cupcake and Cocoa cards! First of all - can I just say that you guys are awesome!! Seriously - I am so grateful for all of your sweet comments and for the inspiration that you give to me - you are all just the best! These few weeks have been a bit busy with my teaching schedule - so I apologize for being a bad blogging friend - but things are looking a little lighter for this week's lesson planning - so I hope to have more of a chance to blurf and craft! yay! I feel - like I have been so far behind in my blogging - so this post is an attempt to catch up a bit... so here goes! 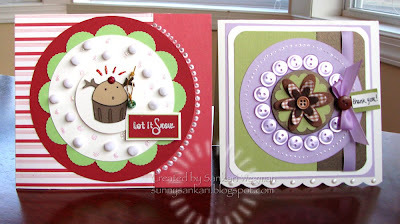 The first two cards come from the sketch challenges at PaperCraftPlanet. Have you guys check this site out?? It is such an amazing site created by Susanna Boyd for those who are serious lovers of all things craft related - you have to check it out and let me tell you - you won't believe all the different things that are available out there to do.... no chance at ever being bored - total place to find your mojo!! The second sketch challenge at PaperCraftPlanet comes from this week's challenge which is hosted by the amazing Tammy H. I had to use my new set from Gina K. Designs for this card - I absolutely love this set and her luxury cardstock - is just absolutely amazing - seriously - stamping and coloring on this paper was unreal - you have to check it out! You can find Tammy's awesome sketch for this week here and more info. about Gina's amazing company here. 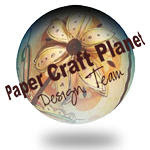 And while you are on PaperCraftPlanet - make sure you come over and say hi on my page there. This card is mainly paper piecing and stickling... 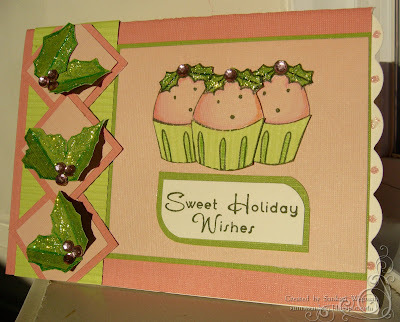 I stamped the cupcake image 6 times and paper pieced the bottom and top halves together...I created the holly leaves and then cut them out and applied Waterfall Stickles and added a little pink bling for the holly. The scalloped edging was done with a corner rounder. 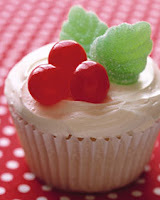 The second card for Taylor's challenge, is this week's cupcake challenge. This week's sketch from Taylor is totally fun - well, every one of her sketches are just fun and lovely! I had play along - even though I should have been doing my lesson planning for the week... but I had to take a break to play along!. 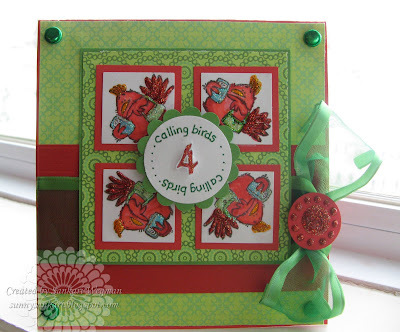 I had so many ideas since I saw the sketch challenge on Friday - but, since I was short on time - I didn't have a chance to play till last night and made a quick (relatively quick :) card that didn't have any stamping. The only "ink" that it has is some Martha copper on the edges of the hot cocoa cup panel. The paper is from K & Co. and the brown cardstock is from the Paper Company (metallic brown). For this card, I adhered the wintery embellishments from Making Memories onto white cardstock with the copper edge tones. I added a little Crystal Stickles for the steam from the hot cocoa. I adhered the DP onto some cardboard for added depth and then tied some baby blue ribbon and tried to do the ribbon Donna style - and it never ceases to work - how Donna ALWAYS creates these amazing bows and even with a tutorial - I can't quite do it -- but I will keep trying!! I really love how this card turned out --- its much more glittery in real life... and it totally makes me want to have some hot cocoa... which sounds so good right about now! All of you who made it this far - totally deserve some blog candy!!! For more details, check back tomorrow!!! Hope you are all having a fantastic start to your work week! Happy Monday to all!!! Thanks for coming over to visit!! Sigh... well, I think that maybe after Thanksgiving - I need to get the holiday groove and crank some out - but I couldn't resist making a xmas card for this sketch. I horizontally flipped Laura's sketch used the elements of Santa's sleigh and reindeers to represent the shapes of her sketch. 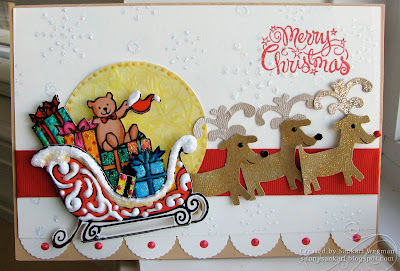 I downloaded the pic of Santa's sleigh here and then colored and stickled and applied liquid applique to the card. The reindeer are die cuts that I sprinkled gold glitter on and then popped up on dimensionals ontop of the red ribbon. 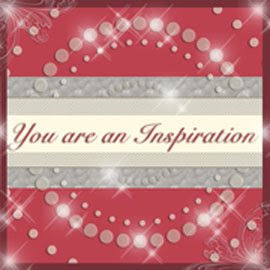 The sentiment was stamped onto a snowflake embossed background (with diamond stickles). The bottom scallops are from a mini scallop punch from Martha accented with red liquid pearls. Sorry to be MIA this week - I really can't believe how fast this week has gone --- and I still have so much to do...! 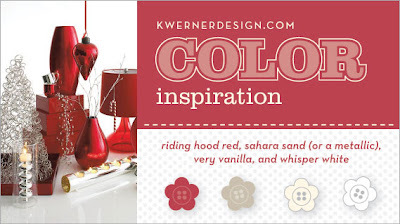 I started teaching and so the work load has increased a little... but there is always time for a little KW color inspiration challenge. This week's challenge was from a picture that Kristina took of her wreath... the orange and yellow colors with the purple reminded me of a sunset... the colors just felt so warm and cozy and so, I created a little sunset amongst the grass. Hope all are well and can't wait to check out everyone's blog soon -- sorry for being MIA and for being such a bad blogger friend -- you guys are just the best!!! Off to stir the veggies! There sure are alot of you who guessed that today's movie pick was Gone with the Wind - it was so much fun to read everyone's comments as they were guessing what the movie was from the sneak peek that Brooke posted yesterday. Gone with the Wind is a 1939 movie that was adapted to the silver screen from Margaret Mitchell's 1937 Pulitzer Award winning novel.. since then it has sold over 30 million copies. One of the most famous lines in cinematic history is the one delivered by Rhett Butler (Clark Gable) to Scarlett O 'Hara (Vivien Leigh): "Frankly, my dear - I don't give a damn." This line was declared by the American Film Institue to be the number one movie line of all time!! 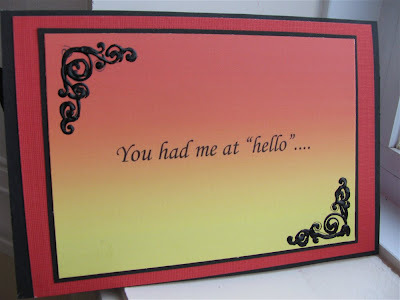 I based my card on this line - on the front of the card it says: "Frankly my dear..." but then on the inside of the card it says: "you had me at hello.." which is a line from Jerry McGuire --- but it just cracked me up to splice in movie lines from different eras... :). I used the fun sketch from Kazan of 2 Sketches 4 U for this card - it was such a fun sketch :) The second card was inspired from the scene with Scarlett resolving to move forward into tomorrow... looking into the sunset. 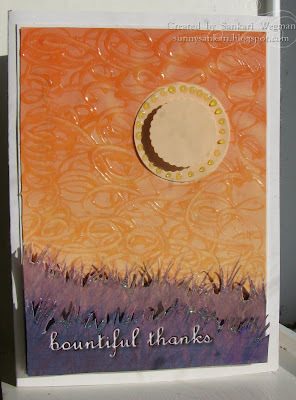 I love the silhouette and so I used that for the inspiration for this card that reads: Celebrate the Dawn - everyday is filled with possibilities and every moment holds infinite possibilites and wonder. These cards were so much fun to make. Come on and join the fun - you can check out our Cinema Saturday challenges here. You have till Thursday to upload it! Can't wait to see your masterpieces !!! Sunny smiles and hugs to all! The Friday Sneak Peek is up!! See ya'll at the movies! Its hard to believe that its Thursday! Where is this week going (gosh, I feel like I am saying that alot these days - I can't keep up with everyone's schedules, the birthdays, the approaching holidays, laundry, housework and work on top of everything else - that's why it was so great to carve out some very needed crafting time. 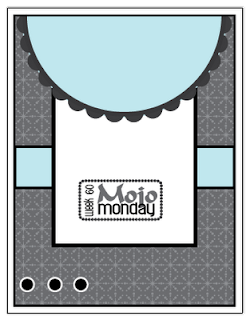 I loved Julee's sketch for this week's Mojo Monday and the top half circle immediately reminded me of the opening of an envelope. I also needed to make a gift for a friend, so I thought I could use this sketch as a top cover for a box that could hold some blank cards that my friend can use. 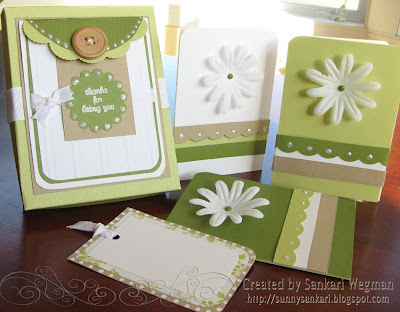 I loved Kristina's color picks this week for her Color Inspiration Challenge- very soothing and used her colors to create the top of the box and the cards inside as well. 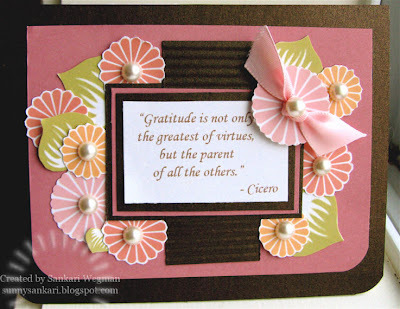 The theme over at PaperCraftPlanet is Gratitude and so I thought this was perfect for this months theme. If you haven't visited yet - you have to check it out - it is an amazing place to find inspiration, friends and all kinds of paper crafting tips and techniques. In making this gift box, have to say that I was kind of excited to create a box.... my first real box that I have made :) I have no idea of the dimensions and didn't really use a template... since I didn't really know what I was doing, but in general - I wanted to make a rectangle box to hold the cards that I was making, so I started 2 rectangular pieces of cardstock (thick) and I scored at about 1" on all four sides for one piece and scored at 3/8" for the other piece. I cut and pasted the corners and voila a box was created . After creating the box, I started the top portion using Julee's sketch. The inside note cards are all very simple. The lines of the different colors (one of which has a scalloped edge from a corner rounder) I adhered on the bottom and lastly finished it off with some liquid pearls on the scalloped edge. The sentiment reads: Thanks for being you. 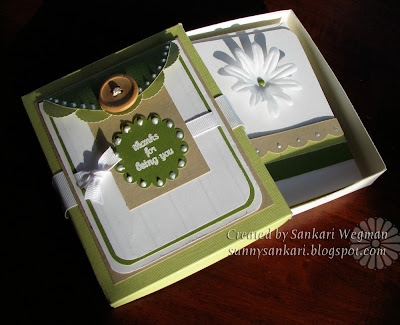 The box has an envelope that opens and reveals a little thank you tag to write a note for the present and then the box opens up to three blank cards that they can use. I love doing Taylor's Friday Cupcake Challenge - but can never quite get to it until Sunday evenings after the insanity of the weekend quietens down. 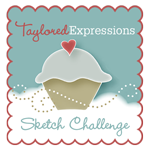 Her sketch this week was a fun one and I couldn't wait to ink up more of Taylor's SASI (Stamp a Sweet Impression) stamps (if you haven't checked them out yet, you can view them here). I have been so excited to use her gingerbread image and so I had to pull it out for this sketch. 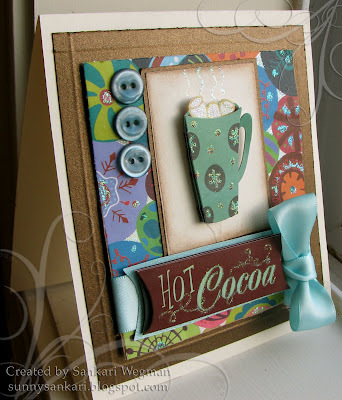 The brown cardstock and papers are from her Christmas kit. 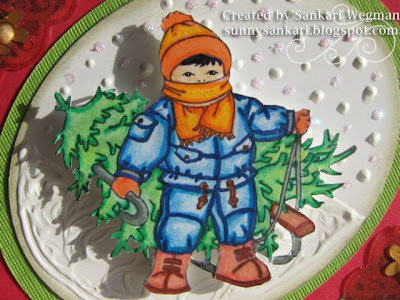 The gingerbread was colored with Prisma color pencils in shades of dark to light brown to yellow tones. The roof of the house was decorated with brads, there is also a golden brad as the door knob. The icing on the house, windows, etc. is liquid pearls. I used waterfall stickles, crystal stickles and orange stickles to color the gum drops in front of the house. 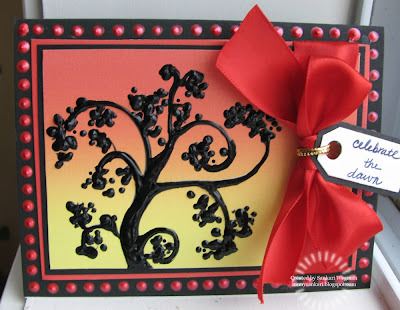 This was such a fun card to decorate and such a fun card to make. Makes me want to eat some gingerbread cookies with some chai.... yum! Hope you are all doing well on this monday! 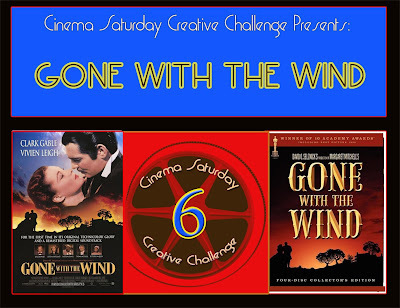 Don't forget to check out what is playing this week on our blog challenge: Cinema Saturday Creative Challenge!!! Every Saturday we pick a movie from which to draw inspiration in creating our craft projects - it is such a fun way to watch movies and make cards, etc. 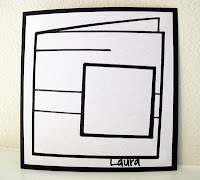 :) and also check out the fun sketch challenge over at Paper Craft Planet! You might have heard that Pluto is not considered a planet anymore (what's up with that??!!) But don't worry - there is a new Planet in town that is waaaaaaaaaaaaaaaaaaaaaaaaaaay better: it is called Paper Craft Planet and it is the creation of Susanna Boyd of Card of the Week. Susanna does such an amazing service to the paper crafting community in her site Card of the Week - because she goes through hundreds of blogs and even more posts and puts it all together in her site - its is such a great way to see what amazing things people have made and are up to. In that same way, Paper Craft Planet takes this to a whole new interactive networking level and is an online community for papercrafters that is filled with familiar faces, a chance to meet new friends and is an amazing new way to draw inspiration from each other, share photos, videos tutorials to all things paper crafted. In one week, the number of people who have joined has jumped from 500 members to 2500!!!! There are numerous Stamp Companies that have created groups and are doing fun give aways and challenges - You have to check it out and it is so easy to join and get started in the fun - click here to get started (if you haven't already) !!! This week, Susanna is hosting a sketch challenge - (below is her fun sketch). Sakura is offering a prize for two lucky winners - all you have to do is to create something crafty with this sketch that expresses the theme of thanks or gratitude and then go over to Paper Craft Planet and link it up to the sketch (use the keyword: Sk110808 when you upload so that everyone can see your work in the gallery!) 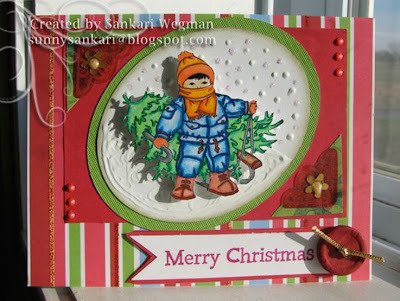 When you are done also leave Susanna a link to your creation on her blog and you are automatically entered to win another prize from Sakura! 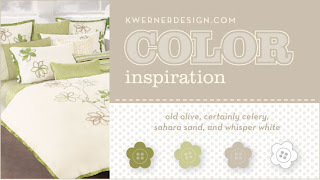 The first draws its color inspiration from the lovely ladies at the Color Throwdown. This week's colors were Old Olive, Chocolate Chip and Pale Plum. The center flowers are from Handmade Heart (felt flowers) and are layered on a scallop punch and a 2"punch on dimensionals. The lavendar buttons race to outerskirts of the circle, which are followed by an outline of liquid pearl dots. The ribbon is from Offray, the cardstock from the Paper Company. 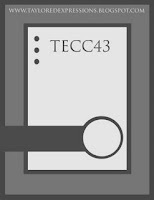 The bottom edge is corner rounded as are the dies of the images. I threaded a ribbon through the center and added a little chocolate button. The little thank you tag was hand written and was punched out from a Fiskars Tag punch and then adhered onto the cardstock. 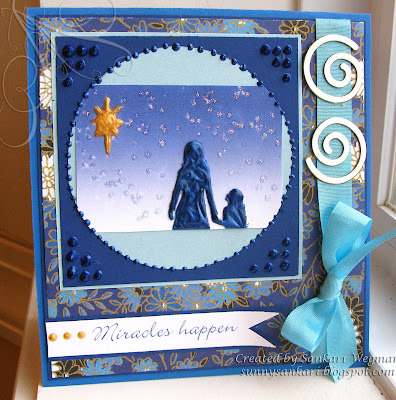 The second card draws inspiration from the lovely ladies at the OCC (Our Creative Corner) - where the challenge this week was to draw inspiration from a holly inspired Martha stewart cupcake. Well, I just can't pass up a cupcake challenge - and Taylor is the guest designer, so I had to play! 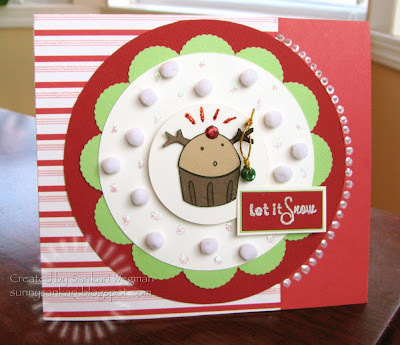 The card for this week's challenge uses her new stamps from the Stamp a Sweet Impression line (this reindeer cupcake is from the Home Sweet Home set). paper pieced the reindeer and put a little red sequin as the cherry/nose and red stickles for the glow lines. The Icut ovet the larger circles with CM cutting system. The papers are from the Paper Company and DCWV. I added some cotton uff dots as snow, embossed the sentiment Let it Snow in white RP and then added some white liquid pearl dots to one side of the cirlce. The scalloped edge of the circle is from a mini scalloped punch from Martha. The center circle is raised up on dimensionals and for a little touch, I added an ornament to the sweet little reindeer's nose. 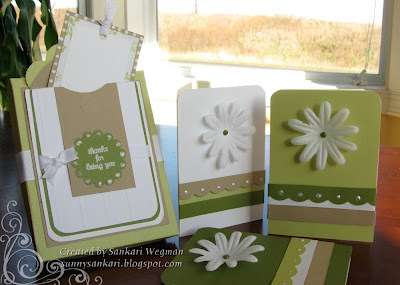 These cards were so much fun to make - I really enjoyed the process :) Can't wait to see all the fun creations that everyone has made - don't forget to check out Paper Craft Planet - and also stop by see what our pick is for the Cinema Challenge Creative Challenge for this week. Cinema Saturday Creative Challenge # 4 - Grease!